It’s cold and flu season, where with a family of 7, it seems like there is always someone sick. While being surrounded by snotty, coughing children, I want to do everything I can to keep my immune system working at top notch so I don’t get sick too. I’ve been taking Sambucus Gummies every day and I really do feel they are working. I’ve coughed a few times or had to blow my nose a few times but for the most part, I haven’t been getting the sickness my kids have been sharing with me simply because they don’t know how not too yet. 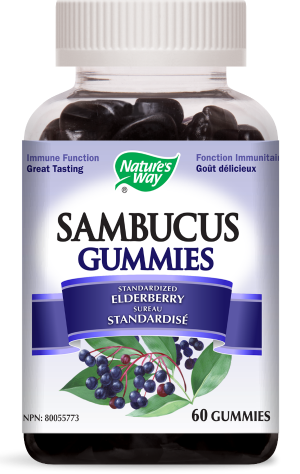 Sambucus Gummies are made from Black Elderberry and they taste great. It’s hard to eat just the two I’m supposed to. As of this writing, these gummies are the only immune gummy product available in heath food stores. It is also the only immune product to contain black elderberry extract. What about the kids? Nature’s Way has liquid syrup for kids. The bottle of 60 gummies (one month supply) is $21.99 and available at many health food retailers. 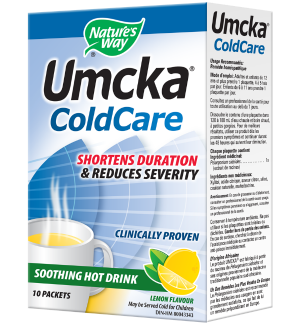 In addition, if the immune gummies do not work or you haven’t been taking them and you get a cold, Umcka Cold Care comes to the rescue. I have not tried it yet because the gummies have been keeping my colds away but if I do get one, I’ll be trying it out. It’s a lemon flavoured hot drink designed to sooth your throat, clear up your nose and even shorten the duration of your cold. It’s main ingredient is called pelargonium sedoides and is the most studied natural remedy for upper respiratory infections. This ingredient is what helps speed up your recovery time instead of just making you feel better during the cold. Shown here is the box of 10 packets of drink mix which retails for $16.98 but you can also find chewable tablets and liquid drops.